No matter how much my kids are growing and becoming older, there is definitely something about Mickey Mouse and the gang that will always have them singing, "It's The Mickey Mouse Clubhouse, Come Inside, It's Fun Inside!" So when we received the latest addition, Around The Clubhouse World, I even sat down and watched it with both my kiddos. Not only do their favorite characters travel around the world, but they also share lots of catchy songs that has had my kids singing them around the house. 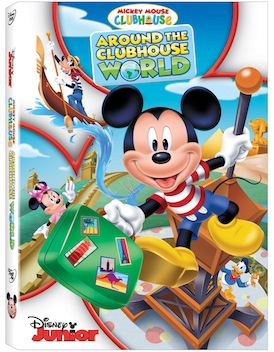 If your child is a fan of Mickey or any of the gang, I would definitely be sure to add Around The Clubhouse World to your collection of DVD's. It's a great episode filled with information they'll learn. Not only do you have this episode, but the DVD comes with four other episodes for your children to enjoy and a free passport activity book for them as well. Around The Clubhouse World is now available in stores on DVD! Disclosure: All opinions are my own. I received Around The Clubhouse on DVD at no cost for the purpose of this review. No other compensation was received.